Missing teeth can affect your appearance as well as your ability to eat the foods you want. How can you know if a dental implant, a bridge or dentures is the best solution for your missing teeth? The answer is as unique as you. A consultation with Dr. Ted Murray, Dr. Kristen Berning, or Dr. Alexia Oetken at Exceptional Dentistry will help you understand your options. Please call 563-556-2711 today to arrange your consultation at our office in Dubuque, Iowa. Complete dentures replace a complete set of teeth. Dentures are prefabricated, customized acrylic teeth in a custom-made acrylic base designed to rest against your gums. The shape of your oral tissue, the way your upper and lower jaws relate to each other, and your own facial shape and bone structure all play a part in the look and fit of the final dentures. Complete examination of soft tissues, jaws and mouth including an oral cancer screening. A first impression of your mouth is made. Wax is used to establish a proper bite, and the shape and size of the dentures. A tooth shade is selected for a natural appearance. You can now try on your dentures to check fit, bite, orientation and esthetics. The final impression goes to the lab for custom fabrication of your new dentures. Your dentures are ready. During this final visit, adjustments are made as needed. A partial denture, or partial, replaces several missing teeth. It is a framework with natural-looking acrylic teeth and gums. A partial denture restores function and appearance and stabilizes the remaining teeth. It is removable and is held in place by existing healthy teeth and retaining clips. If adjacent teeth have decay or show signs of gum disease, these issues will be addressed before the partial is custom-made. Our dentists will conduct a full examination of your teeth, gums, soft tissues and bite. Impressions are taken, which will be used to design your partial denture. Any decay or gum disease found during this evaluation will be addressed to ensure a strong foundation for your restoration. Very minor reshaping of the enamel may be done to ensure a comfortable fit for your new partial denture. A more accurate impression is made of your teeth and gums. The proposed shape and size of your partial denture is tested for fit and comfort. Bite records will be taken. The lab creates your denture from the impression we provide. The new denture is tried for final fit and adjusted as necessary. You will return in 24-48 hours for a follow-up visit to ensure your complete or partial dentures are fitting and functioning well. We will explain how to care for your dentures at home, so you can enjoy many years with your new smile. At Exceptional Dentistry, we continually strive to offer progressive technologies and techniques so you can enjoy a healthy, beautiful smile no matter how past dental issues may have affected it. Please call 563-556-2711 or email our office in Dubuque, Iowa to schedule your consultation. 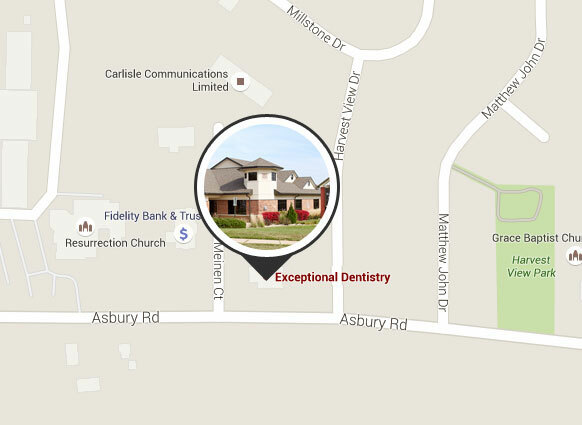 Exceptional Dentistry also serves Dyersville and Davenport.